From the kitchen of One Perfect Bite...We had another gorgeous day and, despite a bad case of Spring fever, a lot needed to be done before the sun set. That meant dinner, if it was going to happen, must needs be light and late. I had seen a recipe in the latest issue of Fine Cooking that I wanted to try and because it was so simple I knew it would be perfect for tonight's supper. Bob was charged with procuring shrimp and while he was at the fish market, I set rice to steam and made the herb flavored oil in which the shrimp were to bake. There was a small hitch. I forget the Silver Fox has an acquisition gene that prevents him from buying anything that is not super-sized. He returned from the market with shrimp near the size of Pacific lobsters. He was about to comment on their cost, but I stopped him before the amount could cross his lips. Some things aren't meant to be shared. The market had shelled and cleaned the shrimp, so I reheated the oil, added the shrimp and after a good toss put the skillet back into the oven. Dinner was on the table in 15 minutes. While these shrimp will never replace my Greek and Italian favorites, they are lovely and I will make them again. I thought those of you observing Lenten abstinence might enjoy a different take on scampi. Here's the recipe. The changes I've made are highlighted in red. I know you'll enjoy this dish. 1) Position a rack in center of the oven and heat the oven to 400°F. 2) Pour olive oil into a 9 x 13-inch baking dish. Add thyme, rosemary, orange peel and pepper. Bake until oil is fragrant, about 12 minutes. 3) Add shrimp to oil mixture in dish and toss with wooden spoons or tongs until all surfaces of shrimp are coated. Bake until shrimp are pink and firm, 8 to 10 minutes. 4 ) Add vinegar and 1/2 teaspoon salt . Toss well and let rest at room temperature until oil cools slightly, about 5 minutes. Discard herd and orange peel. Sprinkle top of shrimp with reserves 1/2 teaspoon sea salt. Yield: 4 servings. I love it that you stopped your husband from telling you the price, and that he didn't feel compelled to, haha! Sometimes the sweetest (and tastiest) things in life deserve to never have their price named in dollars, they are just that good. Thanks for another lovely recipe! I enjoy shrimp, but my husband balks at it. So, I sometimes fix it just for me! Thanks for sharing your blues. 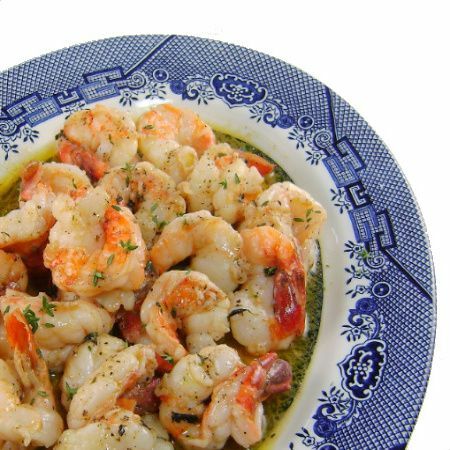 Ahhh, thanks for the Greek shrimp props and thanks for posting this delicious lenten recipe! I can smell it from here - mmmmm. Your husband and mine share that particular gene. It can make for a very crowded pantry. We have toilet tissue and paper towel, enough for a small city. I love shrimp, so this recipe sounds delicious. Thanks againf ro sharing. Have a wonderful week! Simple, quick, and good is a hard combo to beat, I could go for a bowlful of them. Love the combination of ingredients; what a great recipe to save for us as well as when the kids come to visit; thank you. Thank you for this lovely recipe, my eldest daughter LOVES shrimp and with the advantage of the speed of this dish, I know I'll use it again and again. It looks delicious. We have shrimp lovers at our house....if I showed them this amazing dish we would have to go shopping. My Big Guy suffers from the same gene mutation as the Silver Fox, but sometimes it works out just lovely! These look wonderful - I love the addition of orange peel as it goes so well with rosemary. Oh, Mary, I am still chuckling about the Silver Fox's issue with the aquisition gene! I favor big myself. I bought a pork shoulder roast yesterday, for two of us, that could feed a small army... but, I love cooking big pieces of meat! LOL! I think dinner invitations are in order. I am so glad you are having such wonderful weather there, Mary. These look so good and easy to make and the ingredients are in my cupboard and frig right now! That looks yummy and the flower with blue plates are cute. Happy blue Monday,. You know I was looking at a bag of shrimp on Saturday when I went shopping. I will have to try this recipe. My husband does the very same thing--I now make it a point to avoid asking him to go to the store at all costs! Bless his heart, I know he has good intentions, but he's not near as practical as myself! As for your recipe, it looks SO wonderful!!! While my husband is rather picky, shrimp is definitely something we both absolutely love--as do my two kids! such clean and bright flavors on that shrimp, it looks wonderful! Looks delicious Mary.. I will add this site on my list. Thanks for the comment and for visiting my site. It's very much appreciated. Have a great week. I can smell this dish right now Mary! Simple and looks devine! Served with rice, it is the perfect meal! Oooooh!! I can even smell it baking!! This looks wonderful, Mary! The Silver Fox has the same gene I have. It is a wonderful gene to have, no? Especially where shrimp are involved. Looks scrumptious! Ah yes, my husband is in possession of the same gene. I think it would be most interesting to trace the genealogy--perhaps to the same "hunter and gatherer". He's the one who never mentions price. No matter how procured, or the cost, this recipe looks delicious! Yum! I've never had baked shrimp before. Before I became vegetarian, shrimp was my favorite food to eat! My husband inherited the same gene :o) Too funny! These shrimp look and sound wonderful and would make for a very satisfying meal just with a big piece of crusty bread for dipping. Love the lightness of this meal! Great recipe! Looks absolutely heavenly! Baked and herbed, a healthy combination. Feel like finishing that whole baked herbed shrimp,yummm! Delicious looking shrimp! Thousands of geese flew over this weekend giving us hope that spring may actually be here and relieving us of some of our spring fever. Now that is a beautiful plate of food! I love the orange peel in the recipe! So tasty Mary!! !I am a shrimp lover...Would love to try it this way! I finally can sense winter in the air and I am loving it!! I am sure I can still cook this delightful dish!!! Tossing shrimp in olive oil, garlic & herbs is a simple a delicious way to enjoy these shellfish. Thank you very much Mary for the link to my post as well! What more could you ask far. A wonderful meal, served on a pretty blue plate with lovely flowers. I love the flavors of citrus in this! What a refreshingly flavored dish. That sounds lovely but the favorite thing, for me, was the Blue Willow dish. That is my favorite pattern. This look absolutely amazing! Will have to give it a try asap! This was an oft recurring dish in my house growing up. i just find myself smiling and chuckling reading how you stopped silverfox from telling you the costs of those shrimps. anyway, this looks appealing and i guess they are just as delicious as well! I'm still hung up on the peanut butter snack cake! Your baked herbed shrimp looks delicious. Your creations are always mouth watering! I'm having a tea sampler GIVEAWAY on my blog. Please hop over to enter if you are interested. Have a wonderful day, Mary. Looks delicious and simple! Great photo! Shrimp is one of my favorite foods! I can’t wait to make some this week. But what about those flowers? They are beautiful and spectacular!! Are they in your ysrd, what are they? We have nothing blooming yet except forsythia and cherry trees. Love the simplicity of the dish..looks so healthy and yummy! Mmmmm. Love a quick and light meal like this. And I have been making tons of shrimp lately so thanks for sharing this one! Oh Mary, thank you so very much for your kind words. It means alot to me and I am thrilled to find your blog. This shrimp dish looks so fresh and delicious. The presentation is gorgeous! Beautiful dish and what a nice plate. Shrimps are my favorite! With these herbes, it sounds delicious. wow...looks absolutely divine...I love all the flavors going in ! I've added you to my feed as well, your recipes look amazing and the food photos are beautiful! I'll definitely be bookmarking some to try out. This sounds fantastic. Sydney has great seafood but for some reason I don't cook it often enough! What a great meal! Looking forward to following your blog! I found you through the kind comment you left at my blog, thank you! Yummy! thyme and rosemary...perfect with shrimp! Thanks for the link love Mary! Mary, thanks so much for visiting/commenting on my blog awhile back, I so appreciate the kind words. I look forward to browsing through all these delicious recipes!! I love shrimp dishes as it is easy to prepare yet always brings so much joy into the table. My husband is a clone of your husband... when it comes to buying.. maybe it's a man thing..
Ahhh this just looks and sounds incredible!! Thanks for including my shrimp dish! Shrimp is one of my favorites! I love the idea of baking it. Thanks, Mary, for the plug! I have had several new visitors thanks to you! And, your blog is a wonderful resource! Keep the posts coming! this pic is making my mouth water!!! !